I enjoy growing things. As in plants. I am not exactly a crazy plant lady at this point in my life. But I dabble. Not generally a fan of dabblers, I am hesitant to admit it. Yet I did, just a couple sentences back. I am a dabbler when it comes to growing plants, flowers, and all things green. I do not faithfully study the Farmer’s Almanac, much to my father’s chagrin. Nor do I know the pH balance in my soil. I let the chips fall where they may so to speak. Let it be and hope for the best when it comes to gardening. I find the simplicity and the beauty fascinating. The combo, really. Plant a seed. Wait a while. It sprouts up, breaking ground. And before you know it, you have a plant. A flowering plant. Purchase some seedlings. Very small plants. Place them in soil. Water them. Eventually they’ll grow. Larger and larger. Flowers bloom. A small garden. Or a garden in pots. Porch garden. Whatever you want it to be. What fits your domain. I made an observation though. 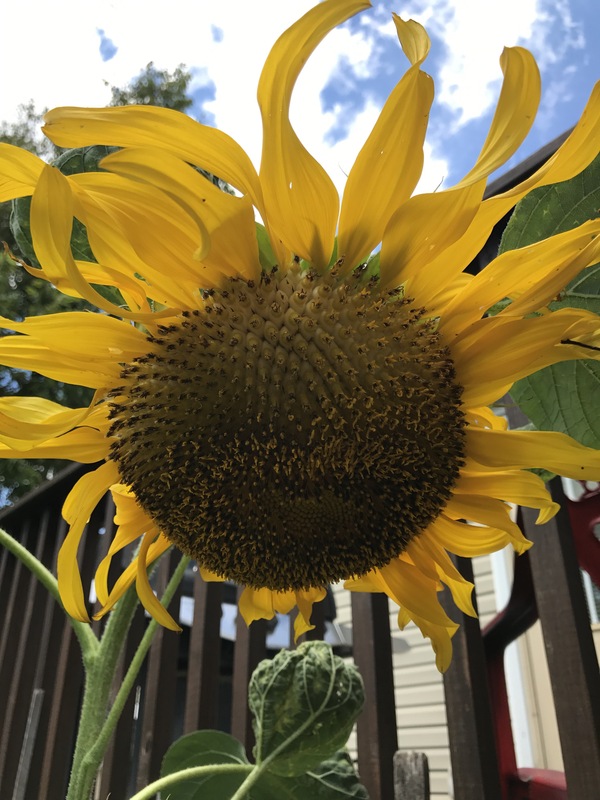 I received a packet of sunflower seeds in the spring. I planted the entire packet, utilizing three different areas of my back yard. Hoping I’d get quite a lot of sunflowers. I don’t how many seeds were in the pack. Fifty? That’d be my guess. Well, one sunflower plant broke ground. Resulting in two flowers. Lovely. I’m happy to have them join my garden members. But honestly I’d hoped for more. 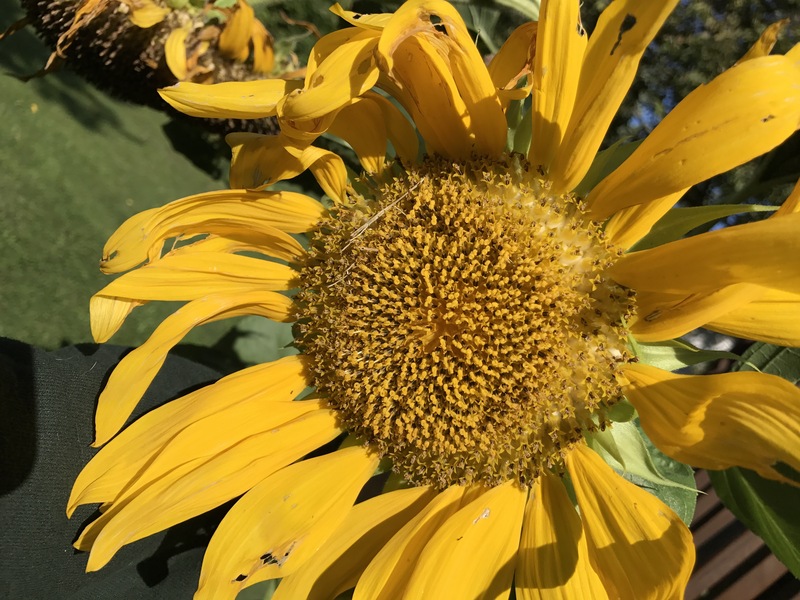 More plants resulting in more sunflowers. But alas. Hold on though. I’m not done with the observation. Somewhere, at some point, during the summer, a potted flowering plant on my back deck died. Yellow flowers. I might have pinched off a wilted flower and tossed it over the deck. Or maybe it happened some other way…but here’s the situation. A flower bloomed. Down underneath my deck. Where my tomato plants are growing. Out of the blue. A yellow flower. And I realized. I can plant seeds all day long. And they might come up. Might not. Plan out landscaping. Buy plants and put them in the ground in an organized fashion. And hope for the best. Water. Sun. You know how it works. But. I can also wake up one morning and realize a flower is growing in an odd place. A place I didn’t plant it. Not a miracle. Not the hugest of surprises. But unexpected. Are you considering that rather cheesy saying? It crossed my mind. But that’s not my point. My point is where I end up. Sometimes it’s a very unexpected place. Literally. And figuratively as well. Growing, surrounded by other growing things. Yet it not fitting together so well. Not making sense. And wondering if I belong. Sure, people plant marigolds near tomato plants. The marigolds repel pests. 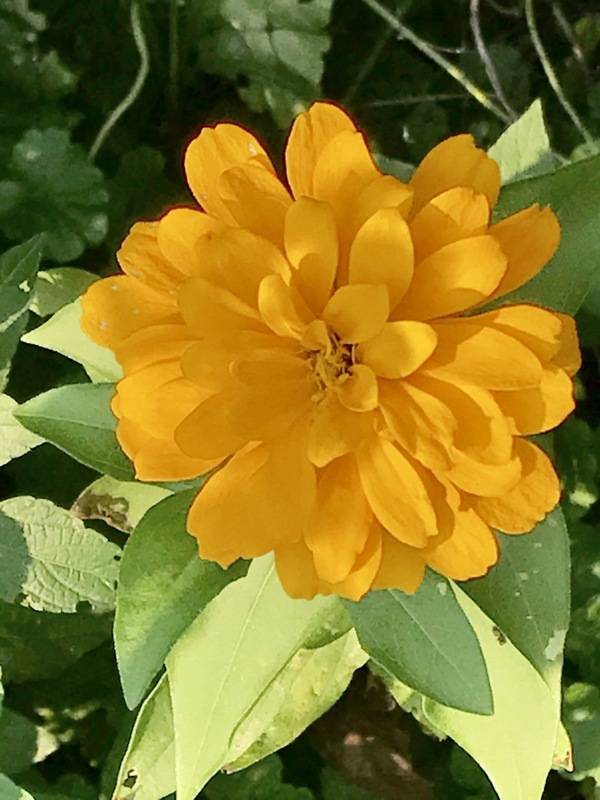 But this is a zinnia. One plant. That is odd. One randomly growing plant boasting one flower. Unplanned. The beauty though of the unplanned. The unexpected. It can wreck you. Or it can send you soaring. It can also do both in the same hour. Wanting a grouping of sunflowers. Reaching toward the sky. Yet receiving something very different. A result of something dead. A dead plant yet. Life was taken and repurposed. Perhaps too dramatic. Yet I’m reminded what can happen. What I can see when I look, closely. How it changes me. My focus. How upon seeing I look more. Again and often, wondering what else might grow. Growth is a challenge. Nothing grows without changing. Think about that. Plants go through stages. As do our lives, even if it’s a momentary episode. Change can result in the finality of the bloom. But the reality is no bloom lasts forever. Cultivation can bring us another. Bloom. Yet science and seasons and the way of the world brings an end. And I hate that. As a human, a person who prefers the lovely over the dead, I abhor it. I am reminded though, too often. It’s necessary. The reaching of a destination, that is. I have ended up many times in a place I’d not expected to be. Which makes me ask myself if I need to become a better formulator of a plan(?) If come what may has taken too much from me. If being directed by another is not the best idea. For me. There’s a scripture verse, 1 Corinthians 15:36 which reminds me. You foolish person! What you sow does not come to life unless it dies. Yes, I realize contextually, maybe this doesn’t apply? I’m not getting into all that. Yet in itself. The cycle. Life then death then life. Nothing. Then a bloom. Then nothing. Then a bloom. Repeat. So maybe not “bloom where you’re planted”. Instead, bloom where the dead came back to life?